At our recent seminar in Glasgow, key stakeholders considered Greengauge 21’s report Beyond HS2 and its analysis is that for Britain, three factors – low productivity, over centralisation and the highest levels of transport congestion in Europe – are inter-related. The seminar considered the common factor of poor connectivity in the context of Scotland, and in particular the challenges ahead in cross-border connectivity to northern England and in connections northwards from the central belt. 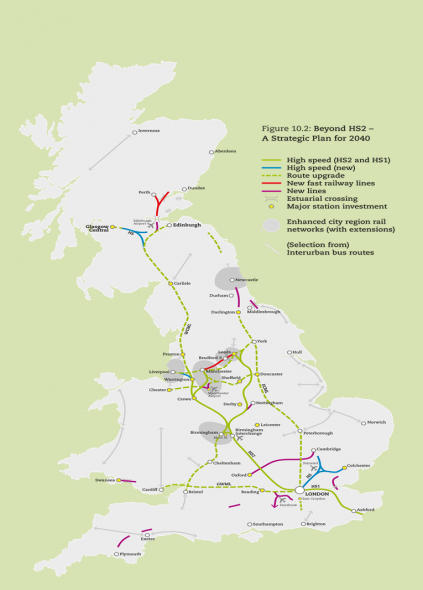 “The cross-border routes face a capacity crunch, as demand for more and better train services linking Scotland with major provincial English cities as well as London will grow over time alongside the need to accommodate increasing freight flows to/from the ports in SE England. While much attention is focused on connections with Glasgow and Edinburgh, Jim Steer points to the new fast link northwards as being of equal significance. “Scotland needs to avoid over-reliance on its highway network if it is to create a resilient and attractive transport system. From the central belt to Perth, Dundee, Aberdeen and Inverness, rail cannot match road journey times, and that’s why we fully support the idea of a fast, new line alongside the M90 motorway”.